A few days ago, a friend sent me a link to a pug-lovers website. 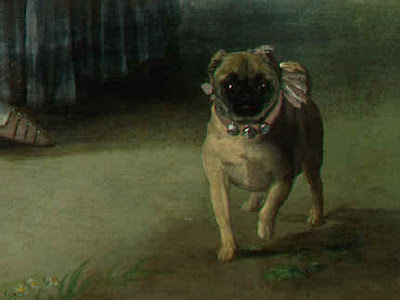 It was filled with a lot of forgettable stuff, but in a section called "Pugs in Art," it had some pug images that I'd never seen before. Does anybody know where to find this image? I'd love to see it closer up. BTW, see that collar with bow and jingle bells? It's an old tradition to put jingle-ball collars on pugs. 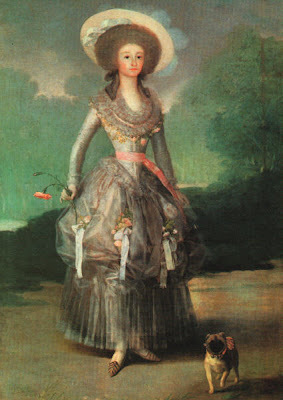 I don't know who started it, but it must have been the aristocracy of some country. When I got my first pug, I thought I'd just look into the price of one of those collars. The traditional maker of the pug leather-and-bells collar is Goyard, a high-end luggage maker in Paris, France. Nice! Not so nice is that they charge several hundred bucks for one dog collar. So, no thanks. I wonder if she's going to get in trouble, not only for scaring the pug, but for horsing around with somebody's prize tiger fur? 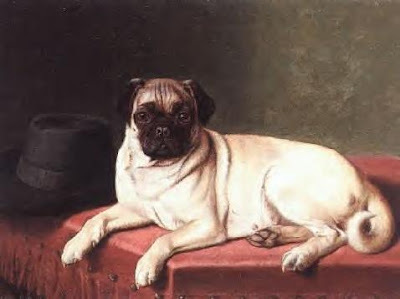 A lot of pugs in 18th- and 19th-century paintings and prints look quite different than the breed standard now. Pugs used to have longer legs, a snout, and overall were a bit bigger than they are now. 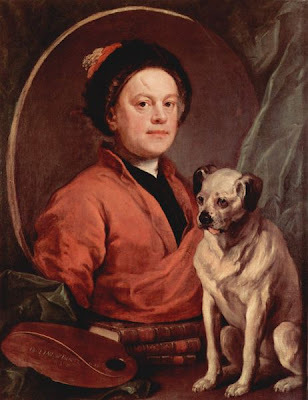 Go back and look how different Hogarth's pug is (first picture, above) from the modern pug. Go on; I'll wait for you while you scroll up and take a look! He hardly resembles a pug, does he? But Trump's existence and breed was well documented. 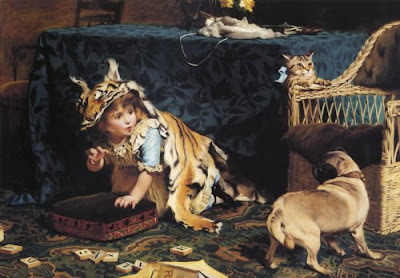 But in an otherwise so-so website, the best find of all was this gem, below, by Charles Burton Barber, a well-known English artist. 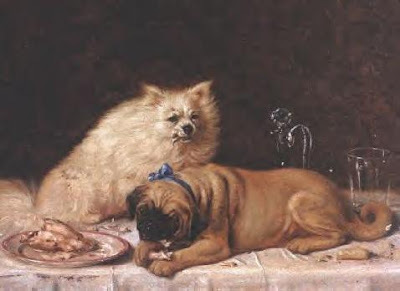 He painted and sketched many popular works featuring dogs and the people who love them. Queen Victoria commissioned Barber to do portraits of her grandchildren. I bet a pug or two crept into those paintings! This beauty is called "Blonde and Brunette." It captures in one image so many things I love--flowers, china teacups, books, domestic peace, coziness, and--of course--pugs. The affection between these two lovely creatures is almost palpable. 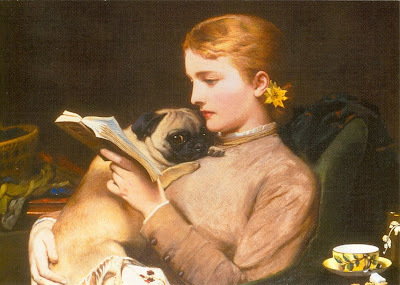 Makes me want to grab a book and a pug, right now!